Tiger FC Big Away Game Final – See You Next Season ! See You Next Season !!! Tiger FC brought the 2014/15 season to a close with its third ‘Big Away Game’ at TBF, Sunway Giza. Kuala Lumpur, 22 May 2015 — Tiger FC brought together hundreds of diehard football fans from across the Klang Valley to revel in celebration one final time this season. The brand ambassadors are psyched for Tiger FC Big Away Game FInal at TBF, Sunway Giza. Held at TBF in Sunway Giza on Sunday, fans united not only to watch two longstanding rival teams battle it out, but to partake in the various on-ground activities, promotions and contests lined up. A brand ambassador assists a Tiger FC fan to log into mobile web application, Playmaker for a chance at winning premium prizes. 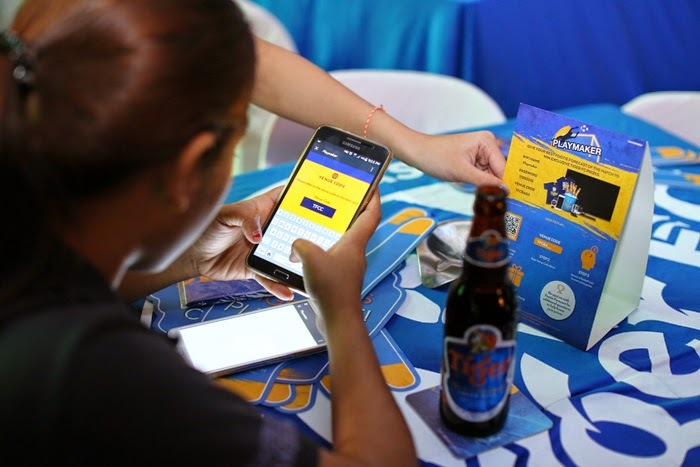 Fans who took up the challenge and defeated the formidable Tiger FC brand ambassadors at the Foosball Tourney were rewarded with a bucket of ice, cold Tiger Beer. Through Playmaker, a football quiz mobile web application, five footy whiz fans walked away victorious netting a smartphone, 50” LED flat screen TV, tablet, compact camera and watch. Tiger FC was also giving out other premiums to those who tried out its mobile game, Dribble Pro. Fans try to defeat Tiger FC’s brand ambassador at a football challenge to win a bucket of Tiger Beer or Tiger Radler. It certainly was a good night out and the perfect way to close the 2014/15 football season. 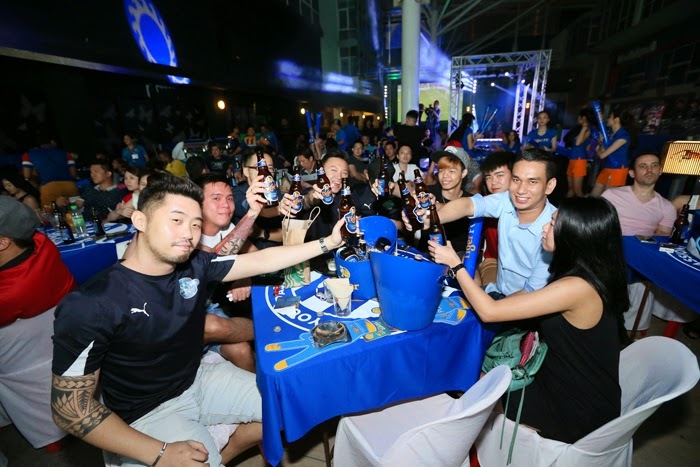 Tiger Beer marketing manager Tai See Wai says, “It has been a good season – for Tiger FC, the fans and league itself. We’ve seen some tremendous action and upsets as the teams fight for the coveted cup and a spot in the Top 4. We’re glad that Tiger FC has united like-minded fans to share these moments together. Fans at Tiger FC Big Away Game held at TBF, Sunway Giza. Apart from the Big Away Game this season, Tiger FC also rewarded three fans via its football contest, The Real Pitch. The competition required fans to pitch why they should be the chosen one for a once-in-a-lifetime trip to the United Kingdom. The grand prize rewarded fans with a 5D/4N trip to London with one stadium match, and a pub match viewing experience. The campaign also saw a collaboration with famous Malaysian YouTuber Joseph Germani, who produced the contest promotional video. For more information on Tiger FC, be sure to visit Tiger Beer’s Facebook page www.facebook.com/tigerbeermy today. Playmaker grand prize winner Leroy Koh Wai Chuen (2nd from right) walked away with a smartphone during Tiger FC Big Away Game held at TBF, Sunway Giza on May 17. With him are Tiger Beer brand executive Tan Kevin (4th right) and the other winners. From 2nd left: fifth prize winner Lester Koh Wai Keong who walked away with a watch, third prize winner Ng Wai Hong who won a camera, second prize winner How Fei Wan who won a 50” LED TV, and fourth place winner Andrew Yang Beng Han (3rd right) who won a tablet. Copyright © 2019 Mistah Fong . All Rights Reserved.